Learn 123 for kids is a free learning app for kids for Windows 8 and 8.1 which helps your kids in learning numbers. This is one of the best educational apps for Windows 8 which is designed and developed specially for preschool kids. It comes with 5 types of math games, playing which your kids can learn counting easily. This app boosts the learning power of your kids and makes them read, write, and pronounce numbers correctly. Get this free learning app for kids and make your kids sharper. This free Learning App for Kids for Windows 8 is easy to get. A link is provided at the end of the article which redirects you to the installation page. At the installation page, you have to click on the Install button and Windows will install the app on your computer automatically. You can also install the app directly from the Microsoft store by typing its name in the search tab. This Learning App for Kids for Windows 8 comes with two different types of games namely, Learn 123 and Learn ABC. The free version allows you only to play Learn 123 game, if you want to play Learn ABC game also, you have to purchase it from its official website. Numbers Chart: Numbers chart contains the list of some numbers from 1 to 100. Click on any number displayed on the screen and computer will pronounce it. This helps your kids in memorizing numbers with their correct pronunciation. Numbers Slideshow: This game for learning numbers displays numbers one by one along with their pronunciation. Playing this game, your kids will be able to recognize and pronounciate numbers easily. 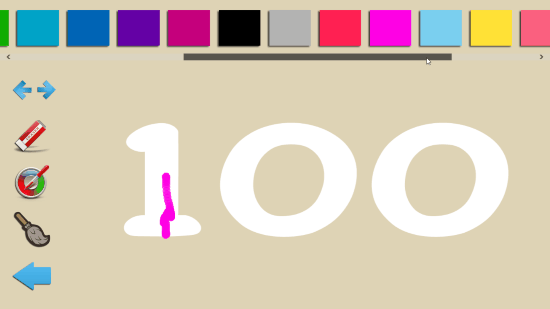 Coloring Numbers: Playing this game, your kids will learn how to write a number. Clicking the paint option, a list of different colors will be displayed in front of you from which you can choose the color of your own choice to color the given number. 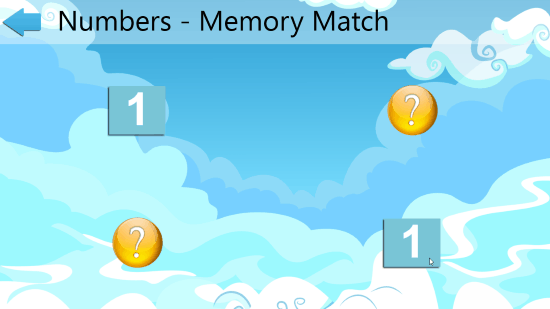 Numbers Memory Match: This game helps to boost the memory of your kids. On clicking any question mark, a number is displayed on the screen. Keeping that number in mind, you have to find out the correct match for that number. Numbers Quiz: Take a test of your kids on learning numbers. By playing numbers quiz game with your kids, you can judge your kid’s performance. Your kids have to identify the number from the given option that is pronounced by the computer. This Learning App for Kids for Windows 8 is a lightweight application. The app comes with 5 different types of math games for kids that help your kids to learn numbers in a playful manner. Download Learn 123 for Kids for Windows 8.